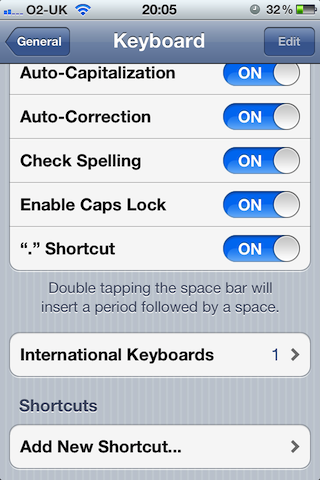 Before iOS 5(s aapl), the only ways to add words to your auto-correct dictionary were either to type the word over and over until your iPhone or iPad learned it, or to add a contact with the word as its name. Neither of these were ideal. Luckily, iOS 5 introduces a much easier way to teach your device new words. To add a new word to the dictionary, tap Settings, then navigate to General > Keyboard. At the bottom of the screen, you should see a Shortcuts heading. Don’t be put off by the name; this is the place to teach iOS new words, but it’s called shortcuts because it’s primarily used to create typing shortcuts, similar to TextExpander. Next, tap the Add New Shortcut… button. You’ll be taken to a new screen with two text fields, labelled Phrase and Shortcut. The important one is Phrase, at the top. This is where you need to type the word you want to add to your dictionary. The Shortcut field, as it says, is optional. That’s where you’d add a shortcut that expands into the phrase you added (more on that in a minute). After typing in a word or phrase in the first field, tap Save at the top of the screen and your word will be added to the auto-correct dictionary. Now, when you type that word anywhere on your device, auto-correct should leave it alone, and if you spell it slightly wrong, it should suggest that word, too. 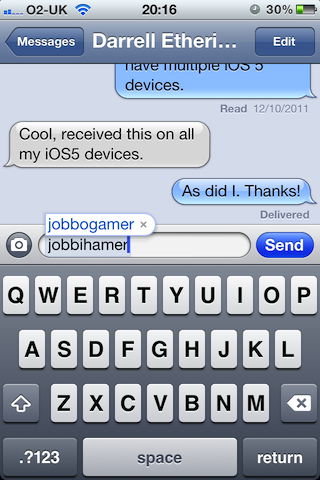 My username for almost everything is jobbogamer, so I added it to my dictionary. 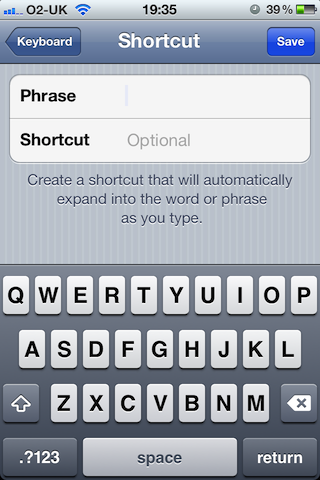 If you’d like to enable TextExpander-like functionality, you can fill in the Shortcut field. For example, you could type “eml” as the shortcut, and set the phrase to your email address. After tapping save, whenever you type “eml”, auto-correct will suggest your email address. It’s very useful for words and phrases you type a lot, and since the feature is baked into iOS, it works in every app, not just those with support for TextExpander Touch, which was the way to get this functionality before iOS 5. I’ve found it incredibly useful to add some words to my iPhone’s and my iPad’s dictionaries. For instance, I’ve added all my email addresses (I have quite a few!) with different shortcuts; my main email address is “eml”, my iCloud email address is “ieml”, and my Gmail address is “geml”. Other helpful words to add are words you’ve made up yourself – I have a few of those, too – and nicknames for people. That way, you won’t have to battle auto-correct to type words that don’t really exist. Lol I’m going to use this next time i use my friends phone so that i can completely screw up his autocorrect. Doesn’t work.. still keeps changing “chem” (short for chemistry) to Chen. Restart your phone. Worked after that for me. The Shortcuts feature allows my biggest autocorrect annoyance to be solved; namely correcting valid words to other valid words, like its->it’s, ill->I’ll, etc. Using “it’s” in the wrong place makes me look practically illiterate, very very annoying. Just adding “its” as a shortcut isn’t enough to override this behaviour (as it is with most longer words), but there is a workaround: add the word “its ” (with a space after its), with the shortcut “its”. Now when I type “its “, autocorrect will helpfully correct it to “its “. To make common words like “it’s” easier to type, I add shortcuts with doubled letters: itts->it’s, iill->I’ll, iim->I’m etc. This doesn’t seem to be working in the official iOS 5 release. Was it removed in beta somewhere? Now if only you could delete auto-correct words you will NEVER use!!! Has anyone tried to create shortcuts to automatically change those words to what you really mean as they come up? Does it allow that?